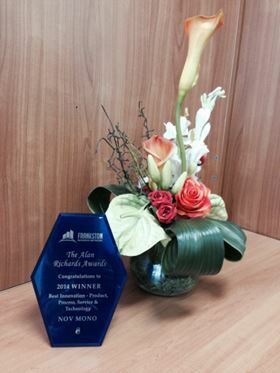 NOV Mono’s approach to commerce and product development has earned the company a prominent Australian business award. Mono was named as the winner of the Best Innovation – product, process, service & technology category, at the recent Alan Richards business awards. Alan Richards was a prominent businessman in the Frankston area of Victoria, and the awards mark the contribution he made to the local business community. “I’m delighted that we’ve been given this honour,” says Andrew Bini, Mono’s business development manager for pressure sewer systems. “Over the past 50 years, Mono has developed strong relationships with customers in many different sectors, such as wastewater, oil and gas, irrigation and food production, so we’ve certainly made a contribution to the business environment that Alan Richards help to create. The unique InviziQ system provides reliable and controllable reticulation of sewage from the household to the treatment plant, and also eliminates many traditional problems such as leakage and unpleasant odours. It is the only system of its type that is designed, manufactured and sold globally, which holds Water Service Association of Australian (WSAA) certification. All other systems offered in Australia are imported and do not hold this certification.